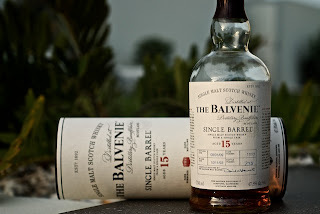 The Balvenie 15 yo Single Barrel is a Speyside single malt whisky matured exclusively in oak casks. As the name suggests, it is sourced from a single barrel (1 of 350) and bottled at cask strength (47.8% abv). The distillery is owned by William Grant & Sons Ltd, a company recognised for having the largest collection of whisky distilleries that is still family-owned. Before reviewing this whisky, I should mention to the Australian audience that this was a gift, originally purchased in the U.S. (thanks to The Distant). I actually haven't seen too many Balvenie malts available in Australia, but I recently noticed The Balvenie DoubleWood 12yo in Dan Murphys. To the packaging: Probably the most refined packaging I have reviewed to date. A simple and classic design that will strike a cord with the sophisticated whisky drinker. The white tube has a tempered/embossed textured which features black text, with red used for highlights. The curvy clear glass bottle has an amazing neck, with a thick and shapely pouted glass lip. This lip enables the whisky to pour like a decanter. The wooden cork further enhances that refined feel, mine also contained a tasting booklet. To the fragrance: Fresh orange juice with slight brine tones. Hints of dried fruit as well, maybe some apricots and raisins. To the taste: As usual it has taken me the entire bottle of this Balvenie expression to deliberate over the taste. Along the way I have found this whisky to be one of the more complex I have blogged, along side the Johnny Walker Green Label, which I struggled to review sometime back. I have deep respect for whiskys that torment me during reviews, to me the suffering only reinforces the inherent complexities of the whisky. Initially it is quite alcoholic, a definable sweetness is present, perhaps the source of that sandalwood flavour reminiscent of the Green Label. This develops into lemon zest and burnt orange notes. I recall these orange notes also when tasting the Glenfarclas 25yo (although they were more refined), indicating these flavours are typical of Speyside. The flavours are really strong, as expected from a 47.8% abv. This one lingers, staying in the throat and chest for some time. I noticed when adding water the whisky to start to cloud up, hinting that it is not chill-filtered. Speaking of water, this whisky is famous (or infamous) for coining Dave's name, the Alchemist. Dave famously added too much water to a dram of this Balvenie, which upon sipping he stated, 'I killed it!' The master of chemistry was born, the Alchemist. Would I buy it again? Possibly, if I could find it...I should try The Balvenie DoubleWood 12yo to get a better feel for this distillers style. To the rating: The dram-o-meter points to a 5.75 out of 7 lightning bolts.